A left anterior fascicular block will have left axis deviation, Q waves in leads I and aVL and a small R in lead III, in the absence of left ventricular hypertrophy. This is a diagnosis of exclusion, after you have ruled out other causes of left axis deviation such as inferior infarction. This ECG is from a man in his 60s who presented after an episode of syncope. This ECG shows bifascicular block (RBBB + LAFB) with a first degree AV block. He underwent pacemaker insertion. This ECG is from a woman in her 70s who presented with sepsis. 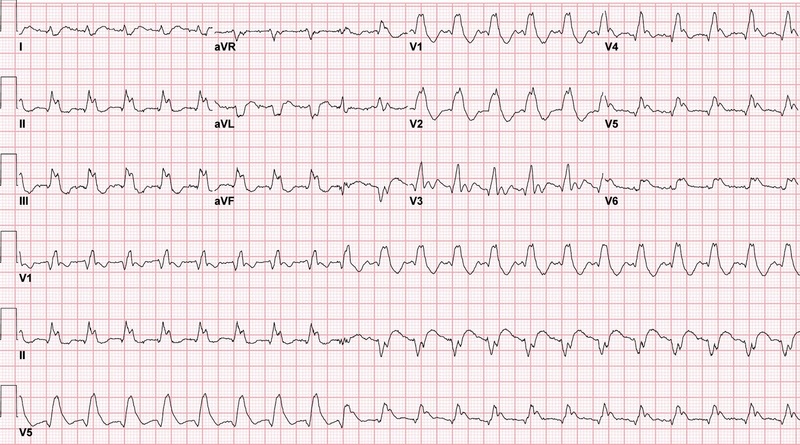 This ECG is from a man in his 80s who presented with chest pain and shortness of breath. This was the repeat ECG just before he arrested. Chest pain and Concordant ST Depression in a patient with aortic valve and previously normal angiogram – on arrival.